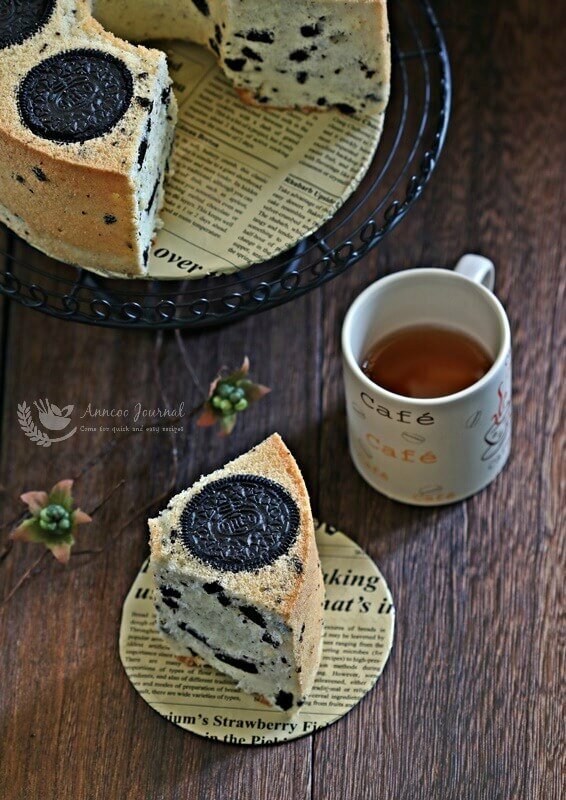 This is a very simple recipe for an Oreo Chiffon Cake and as usual there’s not much of washing up of greasy utensils. Crushed Oreo cookies pieces were added into the batter to give the cake a crusty bite but overall it was soft and light at the same time. 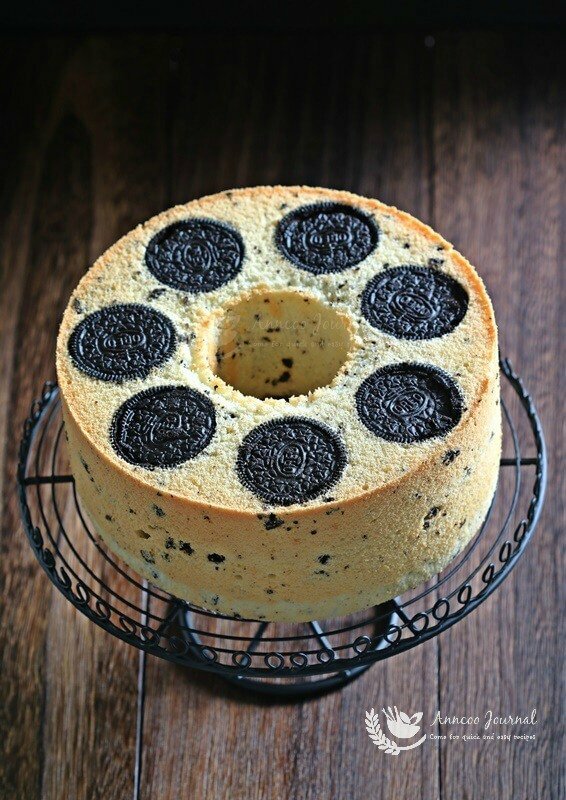 Whole Oreo cookies with cream were placed at the bottom of the tube pan which made the cake look prettier once the inverted cake was removed from the pan. The aroma of the Oreo also filled the kitchen during baking and definitely it’s great to enjoy a slice or two with a cup of hot coffee. In a large bowl, stir well egg yolks, vanilla extract and sugar with a hand whisk. Add milk and oil, stir well again to combine. Sift in flour and mix well. Whisk egg whites and cream of tartar till frothy with an electric mix at low speed, gradually add in the sugar in batches. Continue beating till egg whites at medium speed till stiff peaks form. Add ⅓ of the egg whites into egg yolk mixture, fold well with a rubber spatula. Then gently fold in the rest of egg whites till combined. Lastly add in the crush cookies and gently fold well the mixture again. 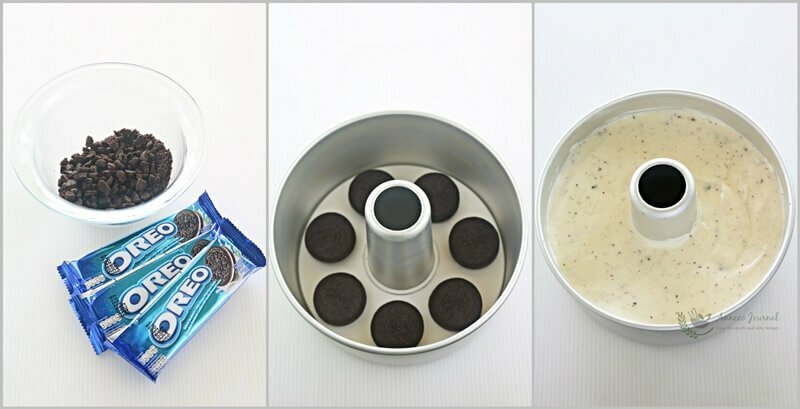 Place 7 pieces whole Oreo cookies at the bottom of a 18cm tube pan.and pour batter into it. Bake in preheated oven at 170 deg C for about 40 minutes. Invert the cake pan immediately on a wire rack to cool completely before removing the cake from pan. Hi Ann, I tried making this chiffon cake. My cake had risen very high during the baking process. When it was done, I inverted the tin to cool down the cake. I used a tin to support the tube pan. After a while, the whole cake began to slight down and landed on the wire rack. I would appreciate it if you could kindly advise me on what had gone wrong. Thank you. Hi Sherry, Your cake is still not fully baked yet that was why the cake dropped off. You may adjust your oven temp to 165 deg and bake for another 10 mins (total 50 mins). Another reason might probably due to your egg whites are not beaten to stiff enough. Thanks Ann for your comment. I will definitely try again. Hi,is it possible to have all the ingredients converted from cups in g? Hi, I’ve writtten the cups in bracket in the recipe. Hi. Can I use water instead of milk? May I double up the ingredients to make a 22cm cake? with 8 egg white? Hi Chanielle, You should use 1.5 recipe for 22 or 23 cm tube pan. 25cm pan is suitable for 7-8 eggs. Hi Lily, just time the recipe by 1.5. Thanks for your help. I will try to make the cake. We love your recipes. Lovely cake, very inspiring! Like the top with the Oreos, will definitely give it a try. So kind of you to share! Ann, baked this earlier, the texture is soft & moist?was so ‘kan cheong’ when saw your recipe so I just used full cream milk instead of fresh milk. Is there a difference? Will bake again & use fresh milk. Anyway, many thanks for all your wonderful & easy to follow recipes. Have a great week! Hi Jen, Thank you for trying this recipe 😀 No problem to use full cream milk too, as long as you like the texture of the cake. 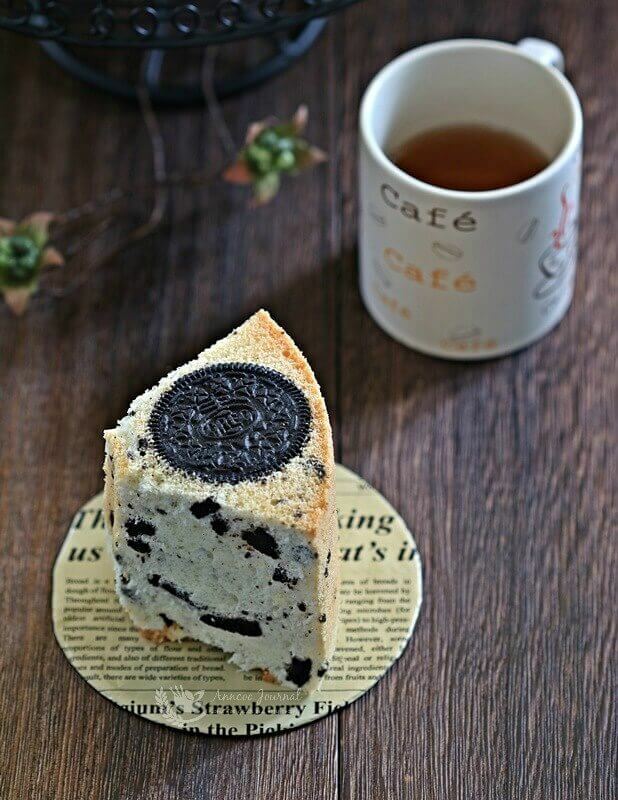 So nice this chiffon cake with oreos, Ann! Such a cool chiffon creation! I am not really into Oreo cookies, but your chiffon looks really great with cookies. Excellent work, Ann.